This morning it was time to board another chicken bus and head to the next destination. Personally, staying in Estali was not the best experience. My bank card and some money got stolen from my rucksack and a rock was thrown at my leg in the street. People say Estali is a relatively safe area, I guess I was just unlucky. I felt uncomfortable and unsafe – which has not been common for me on this trip. The incident with the stone happened when I was with my Israeli friend. It goes to show that being solo or with others has the same dangers. Regardless, I still managed to have fun visiting the cigar factory and waterfalls. However, I was ready to find a better place and that is exactly what I did. I grabbed my belongings and made my way to Matagalpa. I read about a hostel with many hammocks. I figured that was just what I needed. On arrival, I was delighted to see that there was a balcony with hammocks and a nice lounge area too. I felt immediately better, had a chat with the receptionist and found out about a bunch of things to do in the area. I still had the afternoon free so started exploring. I got on another chicken bus and headed to the cascada blanca (white waterfall). It was a rather crowded bus. I was stuck stood up in the middle of the tight aisle grabbing onto a bar. Unsure where I had to get off, I asked someone in the nick of time, squeezed my way to the front and jumped off the moving bus. I paid a small entrance fee and walked down some winding steps to the waterfall. It was magnificent. I decided to get closer and was pleasantly surprised to see my Israeli friend from Leon and Estali – we keep bumping into each other. It’s always nice to see a friendly, familiar face. 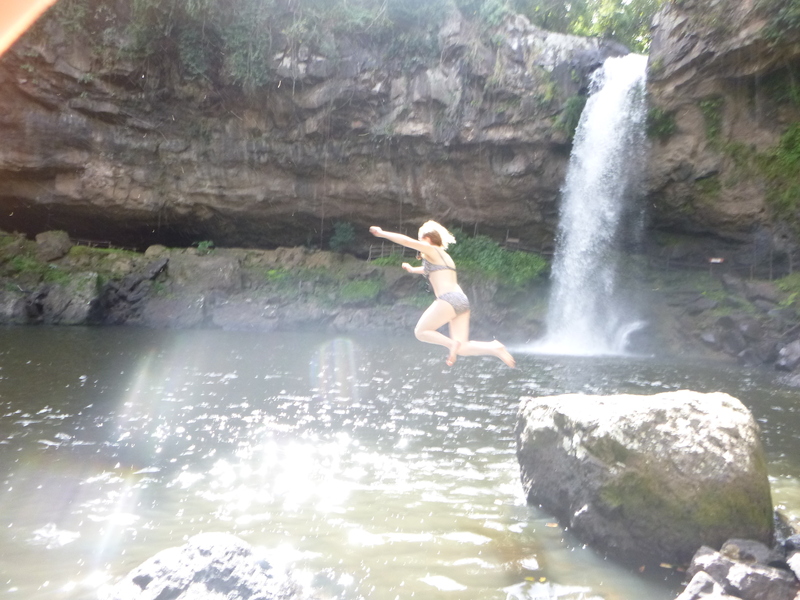 I jumped into a cold plunge pool, which felt so good. It was super refreshing. Then I sat, drying off watching the water gush down over the cliff. The continuous flow of white water smashing down into the plunge pool was never ending. Gravity forced the water down making calming sounds. 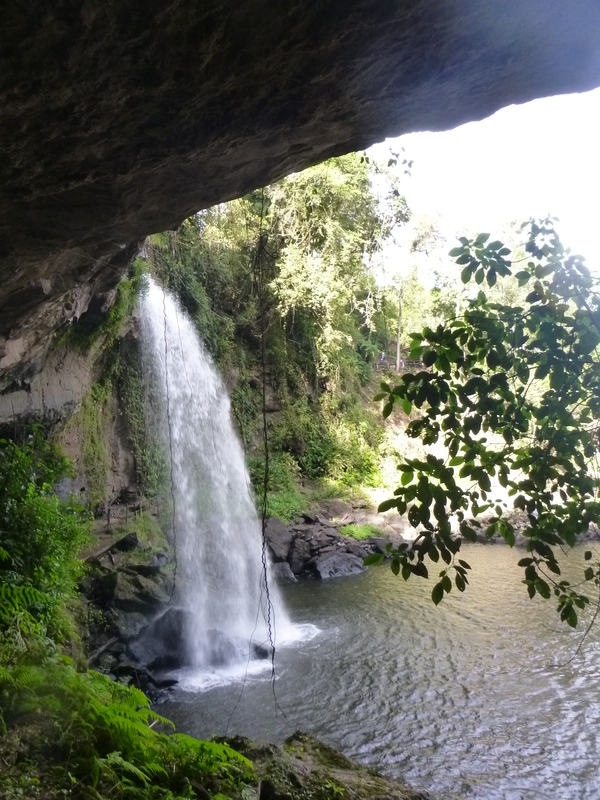 I walked behind the waterfall into a cave and was sprinkled by the cold water spraying off the rocks. The journey back was not too long but very crowed. It was the busiest chicken bus I had even been on. I crammed in near the door. There was barely any room. Then the bus helper ordered me to go further in squeezing in the middle. I did as told and spent the journey wedged between other passengers.